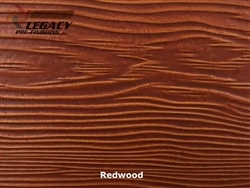 Prefinished Allura Lap Siding | Legacy Pre-Finishing, Inc.
Allura cedar texture lap siding is manufactured to look like real wood siding with a unique cedar texture that will give your home a classic look. 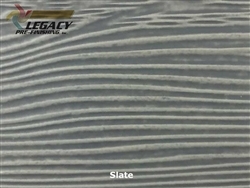 If you prefer a smooth lap siding, Allura has you covered as well. All lap siding products come in 12-foot lengths with a 5/16" thickness and are virtually maintenance free. Allura designed and tested these products to withstand hurricane force winds. We take the factory primed Allura lap siding boards and factory finish them with a custom stain or solid color to fit your vision for your custom home. The colors shown below are our most popular colors and custom colors are available. Our stain colors carry a 15-year limited warranty and can only be applied to the cedar textured lap siding. Our custom solid colors have a 25-year limited warranty and can be applied to any texture lap siding. The trim, soffit and fascia boards can be painted to match the lap siding color or you can choose a complementary color - the choice is up to you. All products are custom finished to your color specifications - made to order just for you. We highly recommend that all of these products be installed by a trained professional siding installer. As a reference for the builder/installer/architect and homeowner please see the Allura Installation Guide.